This week I take a long overdue look at all the DC comic book shows airing on the CW. I first talk about the crazy cold winter weather we had last week (at least it’s gone now). 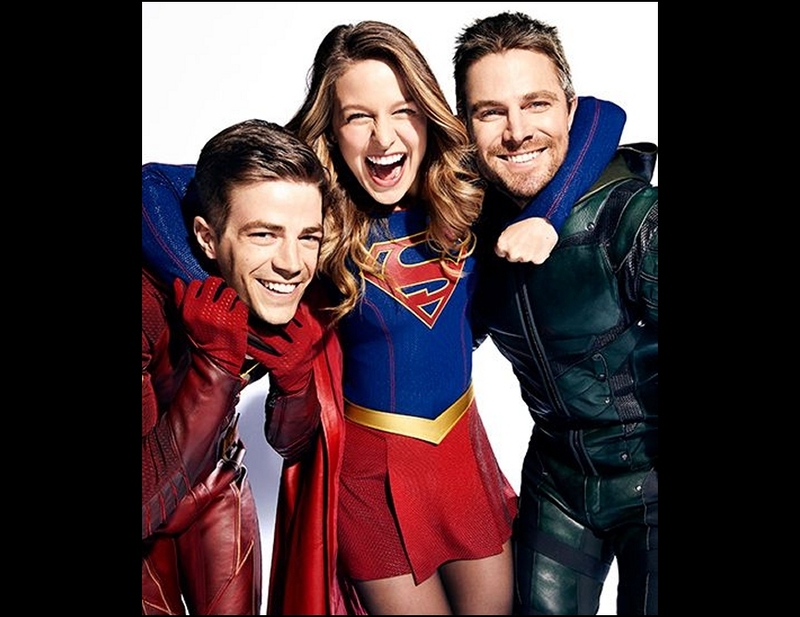 The DC shows on the CW have been some of my favorites over the last several years. From “Arrow” to “Flash” and others I watch these each week near when they first air and enjoy them all greatly. I give a brief overview of each show, the casts and try to give you a little taste of each. If you have never seen any of these you really should give them a try if you like this kind of thing. The casts are all fantastic and each show is a lot of fun in their own, unique way. Hope you enjoy this look at all these cool TV shows. That’s all for this week. Next week should be a guest spot. Today is Superbowl Sunday so enjoy that and I’ll talk to you all again soon. Stay safe out there. To support the podcast go to PATREON HERE. This week I decided to release a repeat podcast of a show I did back in August of 2009 for podcast #238 covering the “Back to the Future” trilogy. This is one of my favorite movie series of all time and I wanted to share the show with all of you in case you missed it the first time or want to revisit almost ten years ago when I recorded this one. I do love these movies and never get tired of watching them or talking about them. Just so much fun! So, sit back and enjoy the ride once again as we go back to the future! Next week will be a Skype chat about the first episode of season three of Discovery. Looking forward to the series being back! So, until next time take care and enjoy your week ahead. Support the podcast over here at PATREON. And thanks to those that do! This week I warp through a quick rundown of the rest of the episodes from “Star Trek: Discovery” season one. I start the show with a little general talk about several topics from comics, to movies, to the holidays. Then I do a brief recap and play a trailer for the remaining episodes from DISCO season one to get us all ready for season two which starts in less than two weeks! I really think season one was excellent and I briefly cover episodes 7-15 of the season. Some crazy and amazing stuff happened with some surprises too. Hope you enjoy the podcast this week. Next week will be either a guest cast or maybe a rerun and in two weeks I’m planning on doing a Skype Chat after the first episode of Discovery airs for season two. Until next time, take care and enjoy your week. If you want to support the podcast you can do that at PATREON HERE. 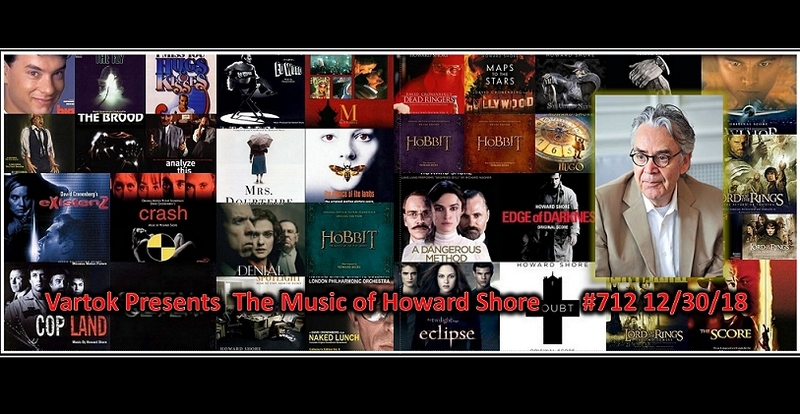 This week we have music expert Vartok guest hosting with a mega-sized podcast all about the music of Howard Shore. Vartok does his amazing great job covering a ton of cool music from this composer. A big thanks to Vartok for all the hard work he puts into these special guest podcasts. 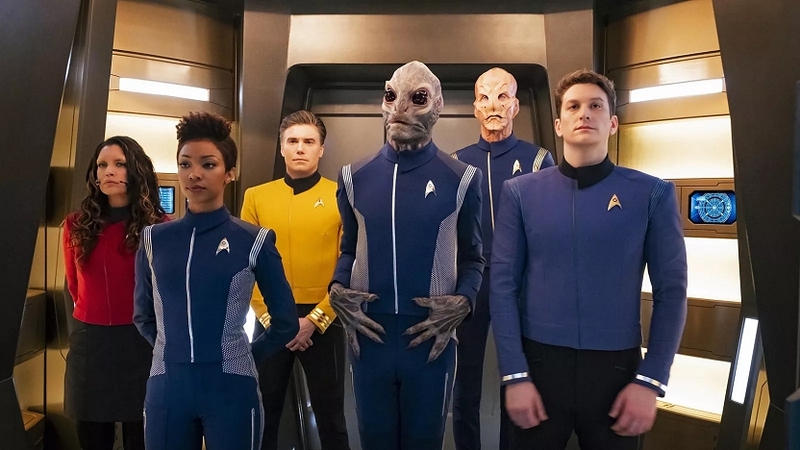 Next week I will be back as I try to wrap up the final episodes in season one of “Star Trek: Discovery” and also talk a little about the “Short Treks” that have been coming out. We are now less than a month away from season two starting on January 17th, 2019 and I’m super excited! A Happy New Year for 2019 to all the listeners of the podcast too! I just put up a special mini-vidcast over on PATREON for supporters of the cast to watch. Please support the podcast if you are able via PATREON. Take care all and have a great week and a great 2019!!! This week it’s my annual Trekmas vidcast. This time I look back on 2018 and talk about some of my favorite films, tv shows and more. Also I slip in some Christmas cheer along the way too. So, sit back and I hope you enjoy my last vidcast of the year. Big thanks to Rick Moyer for his video that he sent in for this show. You can find Rick’s Trekmas music HERE. Next week Vartok will be here for a musical podcast for everyone to finish out 2018 for the podcast. I hope everyone has a wonderful holiday! You can support the podcast via PATREON HERE – and big thanks to those that do that each month! You guys are awesome! This week classic film guest host Mark is back with another classic. This time it’s the great “Fantastic Voyage” film from 1966. Here are some words from Mark about this amazing film. This is Mark Daniels from the Great Pacific Northwest. I’m back this week with another classic science fiction movie. 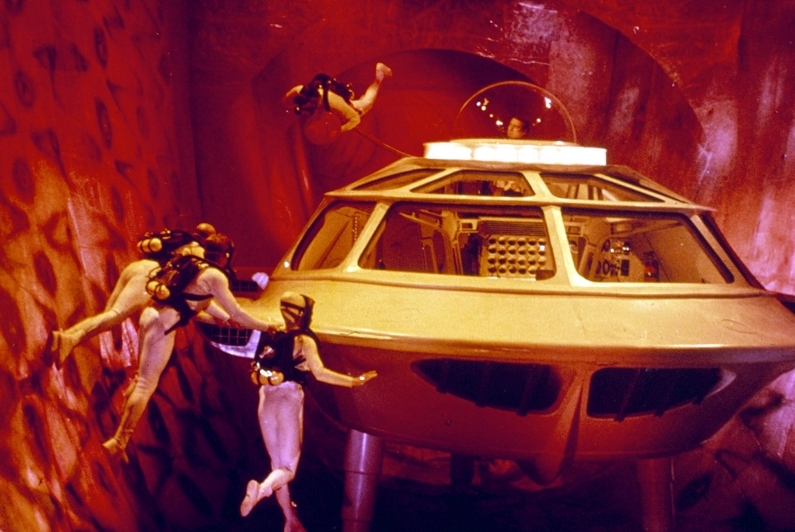 This week I’m going to cover “Fantastic Voyage,” starring Stephen Boyd, Raquel Welch, Edmund O’Brien, Donald Pleasance and Arthur Kennedy. This is a fun movie and I’ve enjoyed this movie since I was a kid. I hope you all enjoy it! If you have a lava lamp, you’ll enjoy this movie! I’ll be back soon with another classic science fiction. This is M-5 signing off. Big thanks to Mark again for another cool guest spot and all of his great shows from this past year. I’ll be back next week with a special Christmas vidcast. In the meantime, go see the “Spider-Man: Into the Spider-Verse” movie because it’s really awesome! Until next time take care. You can support the podcast at PATREON HERE. This week I take a look at the 1977 film, “Sinbad and the Eye of the Tiger.” First up, I talk about two new Marvel movie trailers that dropped this week for “Captain Marvel” and “Avengers Endgame.” Both of these movies look great! I talk about the upcoming (starts tonight) big CW Elseworlds DC comic crossover event too. Then it’s on to the main topic for this week. 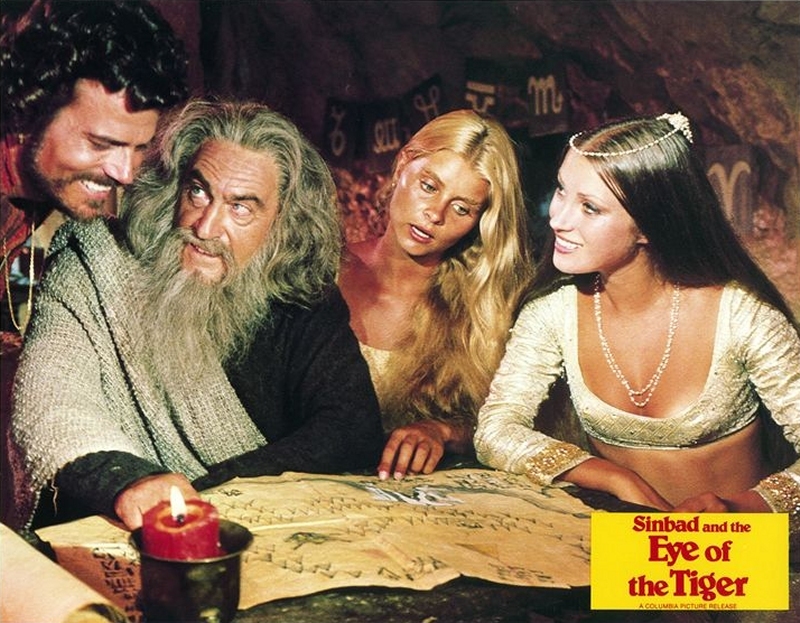 “Sinbad and the Eye of the Tiger” is a really fun movie and again features one of my favorite effect masters, Ray Harryhausen. This is the third in the “Sinbad” line of films and is really cool to watch once again. The move features Patrick Wayne as Sinbad and a very young Jane Seymour as his love interest Farah. Check this movie out when you can, I think you will really enjoy it a lot! That’s about it for this week. Next week I think will be guest host Mark (hopefully) with another classic film and I will be back in two weeks with my annual Christmas vidcast show. Until next time, take care and enjoy your week ahead.